RICHMOND, Va. (AP) — Virginia Lt. Gov. Justin Fairfax said Wednesday he’s asked prosecutors in Boston and North Carolina to investigate sexual assault allegations two women have made against him. “I knew that the allegations against me were false from the moment I first heard them,” he said. Fairfax, a Democrat, said the news media attention has been painful to him and his family. “Sensationalizing allegations does not make them true. Yet airing salacious allegations without evidence does enormous damage,” Fairfax said. Both women have indicated a desire to testify before state lawmakers, who could impeach Fairfax. Republican lawmakers have said they are willing to hold a hearing and accused Democrats of blocking those efforts to project Fairfax. Democrats rejected any GOP overtures to hold a hearing, and have said allegations should be investigated by law enforcement. “A politician’s fitness for office is wholly independent of the workings of the criminal justice system,” Banks said. Nancy Erika Smith, Watson’s lawyer, said Fairfax is trying to avoid having to answer tough questions in public. “He says he wants due process, but a hearing is due process,” she said. “If anybody who watched that wasn’t moved by it, then I would say their heart isn’t in the right place,” Gilbert said. There’s been no indication of any ongoing law enforcement investigations. Jake Wark, a spokesman for the Suffolk County District Attorney’s Office in Massachusetts declined to comment on the status of any sexual assaults investigations in general, or the Fairfax matter in particular. Officials in North Carolina did not immediately respond to a request for comment. Fairfax said he is confident law enforcement personnel will reach the same conclusions as a polygraph test he said he’s releasing Wednesday that showed he is innocent. Fairfax released a polygraph report conducted by a former FBI agent that said Fairfax did not appear to lie when he answered questions about whether he’d assaulted Tyson and Watson. Gilbert scoffed at the polygraph test, saying it did not clear Fairfax’s name and that numerous criminals have successfully duped such tests in the past. “Ted Bundy passed a polygraph,” Gilbert said. 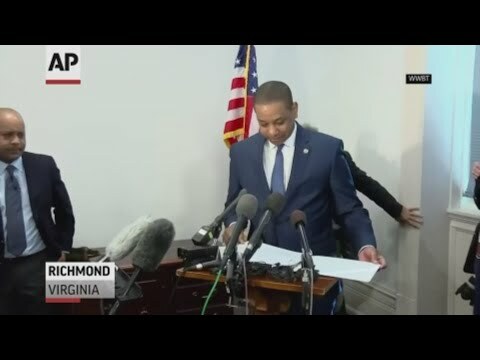 The accusations against Fairfax were part of a series of scandals in early February that upended Virginia politics.